CONDITIONS OF SALE: This painting has to be on permanent display free of charge until cages around ancient Greek monuments are removed, and the grounds become available to their citizens and visitors who like to jog at 6 a.m.
STORY: Those who have a chance to jog on the streets of Athens at 6 a.m. will notice that most historical monuments are fenced and completely inaccessible. In fact, as you have to pay a significant fee to be able come into any of these complexes, they are quite inaccessible to most people who live in Athens. It is this idea that an average Greek person today sees his past mostly through the bars that inspired this AbFab painting. 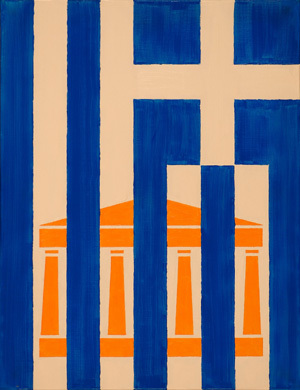 Blue stripes of the Greek flag act as a cage, while some pillars of the ancient Parthenon on the Acropolis are visible behind the bars in orange (deconstructed to two-dimensional geometric figures). There are two things that are wrong with this painting. First, the Greek flag is given in incorrect vertical display. Second, the number of pillars (if every bar covers one) in frontal view of the Parthenon is seven, not eight. Both these inconsistencies are intentional. The message is very simple: when you lock your past, you lock your future. The price is the number of years since the Parthenon was completed. This painting makes no reference to the current economic crisis in Greece, which is meaningless in comparison with more than 2,500 years that Athens serves as an inspiration and foundation of the European cultural identity.